We improve efficiency throughout the marine construction process by providing accurate and precise positioning services for drilling rigs, pipeline lay and derrick barges, and dynamically positioned (DP) multi-purpose construction vessels. Our integrated surface positioning solutions combine Oceaneering® C-Nav3050® differential global navigation satellite system (DGNSS) receivers, gyrocompasses, and inertial navigation systems with state-of-the-art navigation software modules. 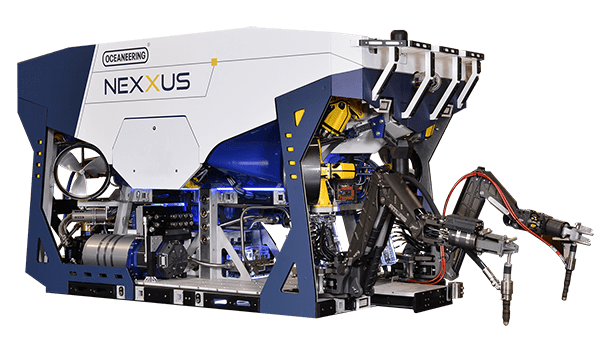 We offer integrated subsea solutions including ultra-short baseline (USBL) and long baseline (LBL) positioning, subsea gyros, Doppler velocity logs, and a variety of sonar systems for positioning and orienting subsea assets such as wellheads, trees, pipeline end terminations (PLETs), pipeline end manifolds (PLEMs), umbilicals, seabed well templates, flowlines, pipelines, and suction piles. Using our own geographic information system (GIS) database, we determine if any evidence of pipelines, hazards, or other subsea infrastructure exists, thus helping you reduce risk during the process. If required, detailed geophysical surveys map or exclude the existence of such hazards and identify appropriate anchoring locations. We also offer positioning services to anchor vessels during salvage operations. Our surface navigation support continues for the entire decommissioning fleet during removal and subsequent abandonment and reefing operations. When severing and lifting jackets from the seabed, we use scanning sonar technology to provide positioning services to heavy lift barges along tow routes to avoid existing infrastructure and hazards. Upon completing decommissioning operations, we provide surveys and support, including trawl boat clearance surveys, 360º scanning sonar surveys, diver positioning, and remotely operated vehicle (ROV) positioning. To support divers and reduce bottom time during surveying, we use acoustic positioning and 360º scanning sonar technology to provide a high-resolution 360° or sector view of the subsea environment. Our system is also used to locate, investigate, and confirm existing hazards or obstacles while providing a dynamic screen presentation of the diver and targets of interest. We also offer acoustic positioning and other support services, including survey support for pipeline depth-of-burial surveys, along with determination of pipeline locations by using magnetometers and probes, debris searches, and spool piece or jumper installations. We use our GIS database to investigate route scenarios and isolate publically recognized hazards. The database comprises publically available data researched and assimilated by Oceaneering professionals. Additionally, we can gain further insights by pulling in proprietary survey data. We support the entire pipeline laying process from developing an appropriate route to positioning surface vessels, monitoring the pipeline’s touchdown point, executing post-lay surveys, and reporting. Prior to pipeline construction, we use our GIS database to evaluate the proposed route for layout dimensions, alignment configuration, and hazard identification. In addition to positioning pipelay barges, we also provide remotely operated vehicle (ROV) positioning for pipeline touchdown monitoring and pre-route inspection. Additionally, we provide USBL and LBL positioning, positioning for as-built surveys, depth-of-burial surveys, mat placement, and any pipeline activity requiring surface or subsea positioning. We offer an integrated ROV and survey service for offshore drilling support, which eliminates survey personnel on board a vessel during a rig move. Our integrated remotely operated survey (ROS) solution enables rig moves to be carried out by qualified surveyors at any Oceaneering survey service office with 24/7 operations. With this service, you receive a certified final location plat based on the remotely generated data. We have decades of experience in positioning jackups, anchor rigs, dynamically positioned (DP) rigs, submersibles, and semisubmersibles. We also provide route planning and navigation support to reposition mobile offshore drilling units (MODUs). Using proprietary data from our GIS database, our team establishes the safest and most appropriate route to the rig’s new location. We provide field navigation along the track for both the rig and tow vessels. For complex projects or those involving the positioning of multiple vessels, we use our field-proven graphic navigation package incorporating differential global positioning system (DGPS) units, gyrocompasses, and a network of radio communication links stationed on the rig and on each handling vessel. Each finalized well location is verified, and the results are presented in a formal survey report that includes the methodologies used, measurements acquired, calculated-minus-observed observations, final conclusions, a graphical representation of the results, a certified plat of the well, and a final anchor location layout. To accurately position ROVs subsea, we use a combination of USBL and LBL positioning. Our cost-effective USBL system is most often used in ROV, AUV, and towfish tracking. Our LBL system uses five or more transponders deployed on the seabed or a subsea structure to precisely measure relative distances, effectively forming an underwater navigation network. LBL positioning offers the highest available subsea accuracy and repeatability, and can be configured to support all types of deepwater construction projects. Typical LBL operations may involve positioning multiple ROVs working in close proximity. We provide ROV subsea positioning services for inspection, maintenance, and repair (IMR) operations involving choke changes, power pod replacements, and flying lead repairs. We routinely provide a variety of ROV positioning services, including touchdown monitoring of pipelines and umbilicals, archaeological shipwreck inspections, push coring acquisition, pipeline depth-of-burial surveys, and detailed inspections of pre-lay pipeline routes. We are experienced in performing subsea metrology. We use specialized acoustic, inertial, and photogrammetric metrology techniques to accurately measure distances, elevations, and orientations between connecting hubs. As spool pieces or jumpers are fabricated, our survey engineers ensure precise adherence to all measurements. During the subsea assembly process of these components, we provide comprehensive positioning services for derrick barges, divers, and ROVs. We have decades of experience performing surface navigation and subsea metrology. We use specialized inertial and acoustic metrology techniques to accurately measure distances, elevations, and orientations of connecting surfaces of subsea assets. With advancements in technology and industry demand for efficient, risk-reducing solutions, we offer remotely operated metrology services.